Warning : long post that might get technical ! When we bought Blue Pearl she had an array of different means to charge our batteries . Solar panels in different locations , 4x 85Wp on an arch at the stern and 2x 30Wp and 1x 40Wp flexible panels on the deck , a wind generator on the same arch , 2nd larger alternator on the engine and a 6KVA diesel generator in the lazarette. When we sailed from Lisbon to Almerimar in early 2017 I noticed that the 440Wp total from the solar panels was barely enough to keep the batteries charged while at anchor and not nearly enough while sailing with the auto-pilot , refrigerator , freezer and all nav equipment all working . And when the wind generator ran it was barely measurable and did not seem to make a big difference in keeping the batteries charged either. After a few discussions with Stuart , during which he send me some sketches and drawings on how a new arch would look I was very impressed and tempted. Now understand there was nothing ‘wrong’ with the arch that was on Blue Pearl aside from that it wasn’t 45mm stainless steel tubing (it was 25mm and kinda imitation stainless as it rusted) but the price he quoted (3300 euro incl taking off the old arch, putting the new one on , fitting the panels on bespoke mounting , adding a pole for the wind gen and a crane for our outboard) was just too tempting to not replace the old one for new . So here we are with a new arch , 2 brand new 335Wp solar panels and a new Victron smart solar (blue tooth connected) 100/50 MPPT controller . The first few months while we sailed in the Med around the southern coast of Spain and around the Balearic islands we had plenty of power . Even with everything running the battery bank would show ‘full’ around 1:30 pm at which time we would turn on the 12 volt water maker to fill up out water tanks . Oh , let me explain what ‘full’ means to me . AGM and GEL Batteries are finicky little things and if you don’t charge them correctly after use they will deteriorate quite quickly and you can ‘ruin’ a brand new battery or set of batteries in a year or so if you don’t charge them correctly and charge them as quick as possible after discharge. The new modern chargers will do all of this charging for you as long as there is enough power to do this furthermore the charger considers the battery bank to be ‘full’ if during a charge cycle it first reaches ‘absorption’ and then ‘float’ , meaning the battery bank gets up to 14.2-14.4 volts depending on the batteries you use (AGM , GEL or flooded). During this time around the Balearics we had one small hiccup as our new Victron MPPT stopped working ! luckily I still had the old MPPT tucked away as a spare so after a quick and easy switch everything worked again. Btw the Victron MPPT was immediately replaced by the dealer , I just send him the tracking number of the old one and he immediately shipped a new one, even without physically receiving the defective one, so kudos to him ! 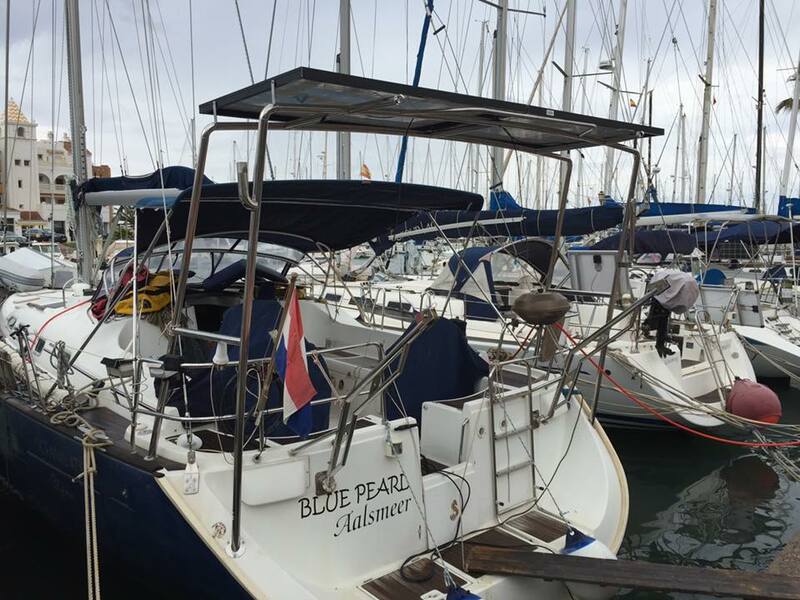 Then Mid August we left the Balearics to cruise to Morocco with a planned stop in Almerimar to do a few repairs on our generator and to receive the new MPPT. Repairs on the generator ? what happened ? Well, even though the solar panels provided most of the needed power and the batteries we’re full at around midday , we still on occasion use the generator to do laundry , make coffee , and during clouded periods make sure the battery bank is charged to ‘full’ to ensure longevity of the battery bank, so one day we started the generator but it stopped producing power ! 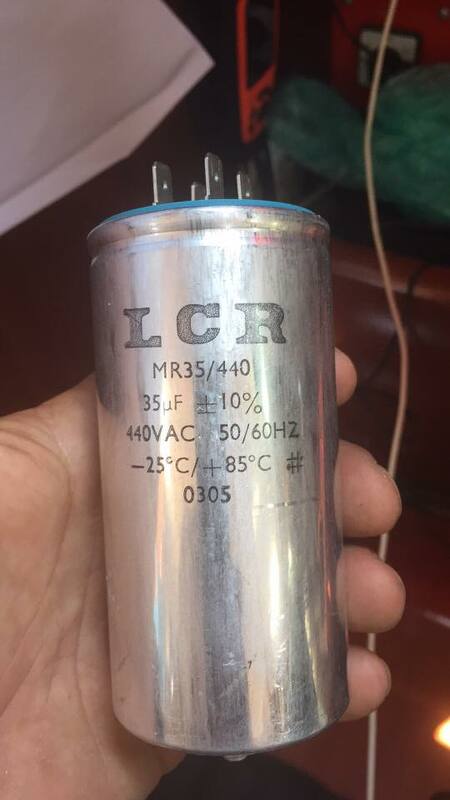 After a day of searching the internet for similar problems , contacting a friend to confirm my findings we concluded that the 35uF capacitor , that is used in the self exciter circuit, was defective . So we ordered a new one online and had that sent to Almerimar together with the new MPPT . So finally on our way out of the Balearics towards Almerimar the winds died on us completely , we started out with 15 kts , this dropped to 10 kts and finally just down to nothing and around Formentera we had enough of the ‘no wind’ situation and we started the mechanical wind to get us to Almerimar. Now on Blue Pearl the mechanical wind has 2 alternators , 1 original one that charges the starter battery and a 2nd (larger) one to charge the ‘house bank’ (5 batteries with total 500Ah capacity) the larger alternator has an external controller that ensures high amps at most RPM’s for a long time to get the battery bank charged fast and efficiently monitoring current , battery and alternator temperature and if one of these parameters are outside the acceptable limit (i.e. battery temperature too high) it will limit the charge current to prevent 1) the batteries from overcharging and 2) the alternator to burn up. Now earlier I mentioned that our battery bank used to be ‘full’ by midday but when we left Almerimar first to Gibraltar and then Morocco and even later in the Canary Islands I noticed that our battery bank never reached the full (float) stage anymore ? I expected (rightly or wrongly) that the more south we sailed and closer we came to the equator , the higher and more powerful the sun would be ? But it seemed like it actually had a , and how weird does this sound, negative impact on the ‘State of Charge’ of our battery bank. Every day that passed the voltage was lower at the end of the day than the previous day ! Our battery bank was slowly being drained the closer we came to the equator ! Then I started thinking .. ‘the burned up alternator , could it have overcharged and killed our house bank ?’ I know that at one point the battery temperature was 55-58 degrees celsius , so could this have killed our battery bank ? 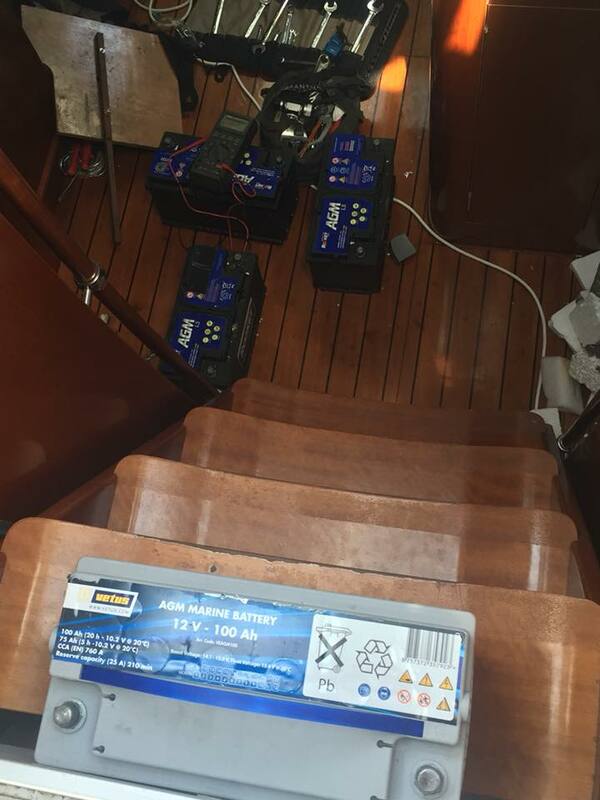 As you may know testing batteries is difficult enough on a work bench as you need to test them after 24 hours of rest , now try to do this on a boat that is constantly used and the batteries never get any rest ! So I tried to unhook one at the time , measure them over a few hours , saw the voltage drop from 13.2 to 12.5 volt while not connected and sighed.. battery bank kaput .. ^$&*$# ’s gonna cost money ! And off we went , anchoring out fully expecting to have full batteries by midday again .. but alas poor Yorick , or poor batteries ,a set of infinite power , of most excellent charge …. they would not be charged fully by Midday ! And I checked all connections , all wires , all shunts , the controller ..everything ! several times, but no full charge , ever . not during the days of full sunshine , only with help of the generator I could get them to fully charged. In Morocco ? .. not full , In Cape Verdes ? . never full , crossing the atlantic , turn on the generator .. (until it died on day 10 due to a defective bearing which made the rotor hit and grind into the stator) never full , French Gyana , Suriname , Tobago , Trinidad then ? .. you guessed it , never full. And it this point I measured the voltage a dozen times, checked the cables , the MPPT , the useless wind generator , everything was checked more than once and it all looked perfectly in order ! And when we crossed from Trinidad to Grenada .. first I noticed that in the morning that battery voltage quickly climbed from a little above 12 volt to 12.9 volt , and when we anchored and came back from customs and immigration the batteries actually had reached ‘float’ .. huh ? why are the batteries suddenly full when they haven’t done that in months without help of the gen set or shore power ? 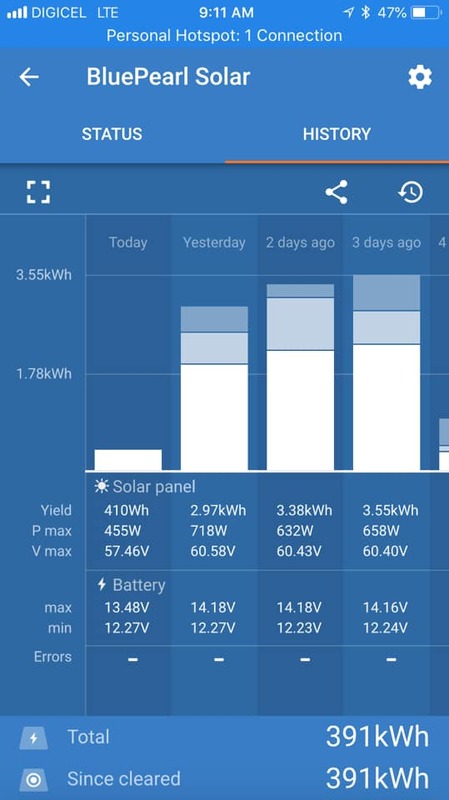 The solar panels produced plenty of power in the Med keeping our batteries full , and do again here in Grenada . the time and space between they struggled even though we got closer and closer to the equator where the sun is more directly above and has more strength . Why the difference ? what is different ? And an off the cuff remark from someone in Trinidad made me think. 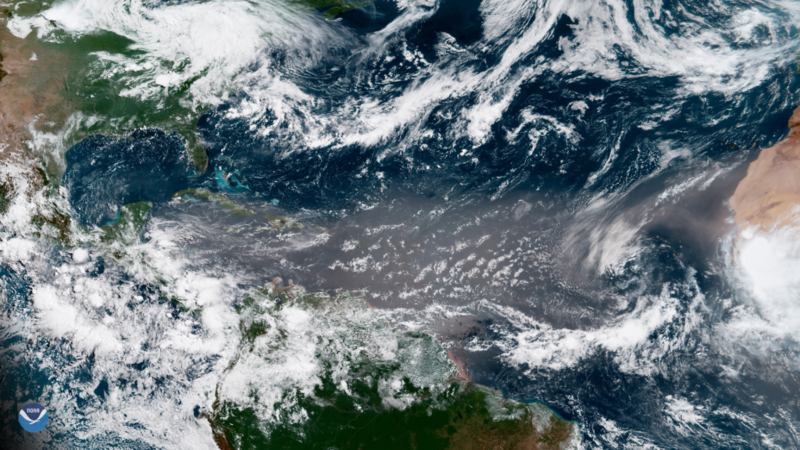 The person was complaining about sahara dust and even before that I noticed several news posts that a lot of sahara dust was blown over to south america this year causing dust debris as far north as florida ! Could it be that these ‘sahara dust clouds’ have such an impact on the power of the sun that the difference in PV daily output is 25% ?